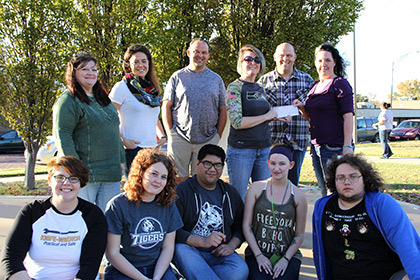 Richard and Angela Steiner, the owners of the Labyrinth of Terror in Winfield, have worked with Cowley students for the past five years, contributing to various club funds. The couple recently presented three clubs on campus with a little more than $1,000 for their work during the haunts month-long run. The three clubs involved in the fundraiser were the Diverse Tigers Club, Creative Claws and Media Club. Cowley cosmetology students also helped by doing the makeup each night. Students in the clubs were the actors in each scene of the haunt and the sponsors acted as guides. Media Club is planning a trip to New York in March and will use the funds to help offset the cost of airfare and conference fees. The Creative Writing club will use their funds for author or writing trips in the spring.